Early Childhood Education for Muslim Children foregrounds the marginalised perspective of Muslim children aged three to five and examines how they are cared for and educated in centre-based provision in two provinces in post-apartheid South Africa. Both theological and social science perspectives are carefully interwoven to make sense of the construction of service provision for Muslims as a minority group in a secular democracy. This book uses a qualitative, reflexive approach to amplify the voices of mothers, managers and teachers as the community of agents who shape priorities for young children in the context of a rapidly transforming society. The research demonstrates that the quest to establish an appropriate care network and a sound educative environment for Muslim children is riddled with complexities, struggles and tensions. In the light of changes in the home-based network for early education, centre-based provision has become an important infrastructure for Muslim communities seeking one-stop academic and Islamic education. The internal struggles encountered in this form of provision include inequities in access, struggles to package an appropriate curriculum, and dealing with nurturance specific to the faith and for cultural formations supportive of citizenship. Hasina Ebrahim has produced a remarkable text. Based on multidisciplinary approaches, and drawing on research in selected Early Childhood Development sites, this book provides a sustained focus on the multiple factors that influence the way in which young children grow, develop and learn in a Muslim – centric educational context. The book’s perspectives are important in that it represents a departure from dominant constructions of childhood. Ebrahim’s account succeeds in working against the negative publicity that Muslims are experiencing in contemporary times. This book makes compelling reading. For people seeking to understand the early childhood education of Muslim children from the Islamic and social science perspectives, this book is a must. It is the first on the subject. What you’ll learn from reading this book is that Muslim minorities face many challenges in preserving their identity in predominantly secularised societies. It shows how early childhood centres for Muslim children are serving as alternative educational institutions for faith development in the formative years. A masterful and incredible account into the early socialisation of Muslim children. This book is well-timed at the point that early childhood education in South Africa has become a national imperative. A truly gifted scholar of early childhood education, Ebrahim interrogates how a particular worldview influence perspectives on how Muslim children are educated in Islamic contexts that frame early childhood education. Inspiring, mesmeric and highly alluring. 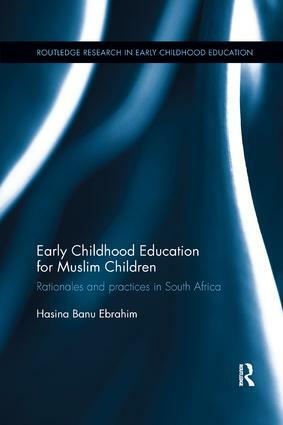 Hasina Banu Ebrahim is a Professor in Early Childhood Education at the University of South Africa. She is a rated researcher with the National Research Foundation in South Africa and her research focus in on Early Care and Education policy, practice and teacher education. This series provides a platform for researchers to present their latest research and discuss key issues in Early Childhood Education.